Have you always wanted to cross stitch but the thought of all those little "x's" are a little bit intimidating? Don't be afraid to start this fun new hobby. 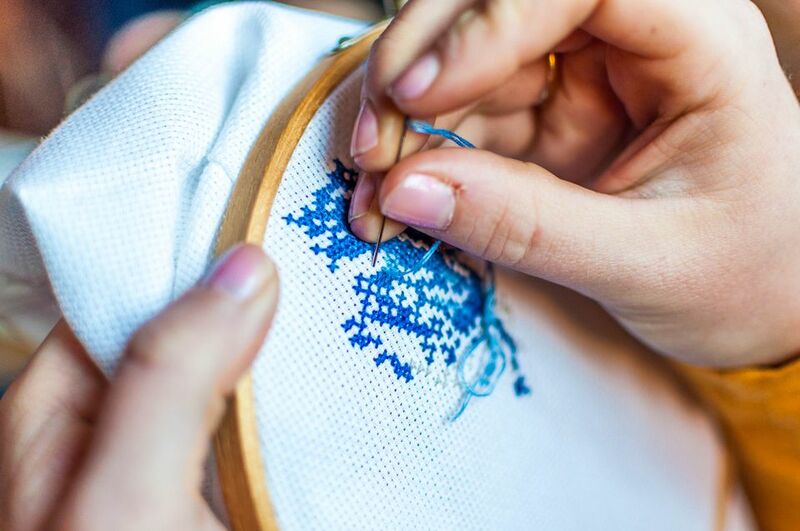 It is easier than you think with just a few easy steps Beginners to Cross Stitch can learn to stitch a small design as they complete three lessons. Tips for beginners are included. An embroidery hoop is made up of two rings. An inner and an outer hoop. The hoop with the hardware is the outer hoop and the one without any hardware is the inner hoop that fits into the hardware hoop. You will have to unscrew the hardware to separate the two pieces. Do not force the separation! Separating these rings is the first step in the process of putting fabric in a hoop. The fabric should overlap the hoop by at least one to two inches. You do not want the fabric to be in the way and have the possibility of getting tangled in the stitching but you also do not want it so short that it will unravel if you try to stretch it out. Choose the size of the hoop based on the size of the fabric. Do not use an 8-inch hoop for a 12-inch project. You run the risk of the fabric getting dirty. From the center of the fabric, count over 12 squares to the left and mark it with a needle. Next, count up 11 squares to find the starting point for your first stitch, marked with another pin. Bring the needle up through this hole and stitch a half stitch. Flip to the back of the fabric and secure the end of the floss by dragging the end of the floss under the loop formed by the back of the stitch. 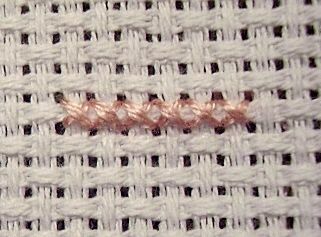 As you stitch the row of cross stitches, you should stitch the end of the floss under the back of the loops. Flip to the back of the fabric frequently to ensure that this is done. Continue stitching half stitches until you have completed six half stitches. Bring the needle up through the lower right hand corner of the square as shown in the photo. Work back across the row of half stitches, crossing each one. After completing each cross stitch, flip to the back of the fabric. Secure the floss by running the needle and floss under the back of the stitches. Now that you have the hoop set and the first block done, you can move onto the next and continue from there. Depending on how many blocks you want, you will continue on with a different color. You can also start moving down and make bigger blocks out of the smaller ones. This type of project is great practice for stitching between colors. Many people "park" one color to move onto the next and then pick up the contrasting color. This is a way that you do not have to rethread your needle and cut your floss. If you part the needle, you can pick it up at any time. The only downfall of this is the loss of floss and running out. Stitching a color block is an easy way to work on your stitching skills. It allows you to get the feel to move between colors. Once you feel comfortable with this type of stitching and color change, you can move on to shading and more advanced color cross stitch change. Color blocks are great for cell phone covers, accessories such as glasses case, tote bags, and small zipper bags. It would also look wonderful on a Christmas stocking. Don't be afraid to think outside the box and try this technique on pieces of furniture. The possibilities are endless with this tutorial and pattern.